While artificial turf has become more and more popular, natural lawns have taken a back seat in many landscape projects. However, before you decide to use artificial turf for any project you have planned, you must first realize the benefits of turf grass to your community and home. Grass has many benefits that you may not think about when considering which material to use on your field or lawn. Keep these benefits in mind as you research your decision. The weather elements can have a severe impact on your soil. 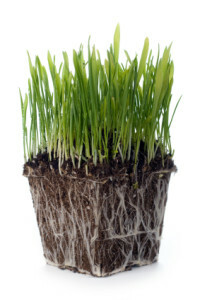 Turf grass prevents erosion and keeps the soil healthy and vibrant. Its roots knit the soil together, keeping it from moving and losing its quality. You also reduce the amount of dust in the air with turf grass. With the roots holding the soil in place, there is less of a chance the dirt will be blown away by the wind. The grass also makes for a nice settling ground for any airborne dust. Turf grass can absorb rainwater, intercepting rain drops as they fall. This prevents runoff, making it much more difficult for sediments and other particles to enter streams and rivers in your area. Lawns can absorb a lot of water throughout the typical year, meaning the ground supply will not run low and your soil will be healthier for it. Turf grass lawns have a natural cooling effect that can help keep urban areas from becoming too hot. These lawns can help reduce the amount of energy used to keep cool, as well as have significant effects on water evaporation, air pollution, and green house effects. A large enough area of turf grass can be much more effective and energy efficient than any air conditioning system. Not only can turf grass help to clean the air around us, but it can also increase the amount of clean oxygen in the air. By absorbing carbon emissions floating around in the air, turf grass can increase the quality of the air we breathe. You can have your own personal oxygen producer with nothing more than a fifty square foot lawn. Artificial turf is gaining popularity because of its low-maintenance qualities. However, the benefits of turf grass to you, your family, and the environment far outweigh the benefits artificial turf can provide. Turf grass even makes your lawn look more beautiful. Make the right choice and go with turf grass for your landscaping project.